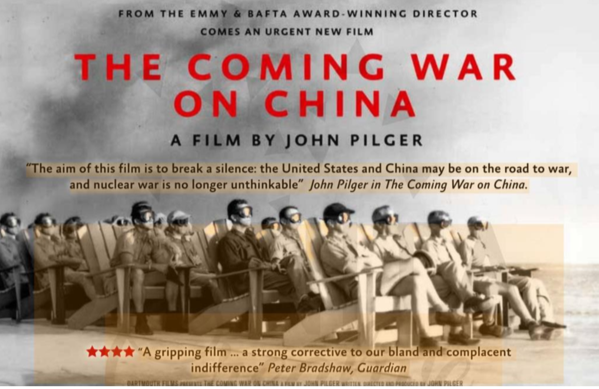 The documentary was introduced by Dr Alison Broinowski AM, author and former diplomat, who noted that Pilger’s documentary is divided into chapters including ‘The Secret of the Marshall Islands’, ‘China Rises’, ‘Resistance’ and ‘Empire’. This structure guarantees a comprehensive appraisal of a truly dangerous situation and calls for a strong response. Dr Broinowski commented that a hallmark of Pilger’s films, poignantly presented in this work, is the focus on the human cost of the lies and power plays of Empire. The ‘Coming War on China’ uncovers many hidden and discomforting truths. An example of this is the chapter on the Marshall Islands where the US conducted a series of nuclear tests. Pilger recounts the nuclear tests at Bikini Atoll in 1954 and the horrific degradation and contamination of that atoll by a series of nuclear detonations including the 15 megaton hydrogen bomb known as Bravo. The subsequent treatment of the former inhabitants of neighbouring islands, who were not evacuated at the time of this nuclear test, became the fulfilment of Project 4.1 “which began as a study of mice and became a study of human beings exposed to radiation “. The term ‘guinea pigs’ comes to mind. The chapter ‘China Rises’ is a fascinating exposé of historical truths regarding China-United States relations. One example is Mao Zedong’s appeal to the US to normalise mutually beneficial diplomatic and commercial relations between the two countries. Another involves the hidden history associated with the trade in opium during the 19th century. It is argued that early U.S. development owed a lot of its financial impetus to the exploitation of the Chinese population by American merchants engaged in the lucrative opium trade. The chapter on Resistance recounts the dogged, daily battles conducted peacefully by a range of ordinary people around the world. One example of this is the campaign by Okinawans who are opposed to U.S. military bases on their island. For Pilger such popular movements are the source of both inspiration and hope in the face of the threat of nuclear annihilation. The true story of China and America needs to be told, especially in Australia where, fuelled by the US administration, an anti-China propaganda campaign seems to be inviting a military response. 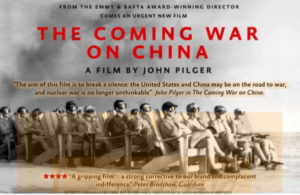 John Pilger’s documentary ‘The Coming War on China’ can be viewed in full here. For more information read John Pilger, ‘The Coming War on China’, New Internationalist, Nov 30, 2016. A list of John Pilger’s documentaries can be accessed here.